Obviously there's a healthy attainable productive balance between the two extremes. Still, since the release of DNF, many more people have praised the HRP than DNF. The proper thing to do would be to port the game literally, much like the Total Meltdown mod. The maps are already there. All you have to do is make the assets work. 2 or 3 people could bang the whole thing out in a year with consistent work. If we're talking about exactly replicating the gameplay, I'm not sure that would give the best results.... The game plays as if in slow-motion, as the console-shooter it is. It makes it feel clumsy and unresponsive with mouse/keyboard controls. Porting the levels and recreating the enemies/weapons in Duke 3D could, I believe, make it a more enjoyable experience than straight porting. You exactly replicate it. Mods that can be added on top can bring gameplay up to snuff. On theory, that's how it should be. The problem is that (from my personal experience) it would take an impossible effort to reverse engineer this game, and the game itself is not very good gameplay-wise. The game itself is not very good gameplay-wise. This is wrong. It's a great game. Yeah. The only real issue Zero Hour had was the limitations of the hardware causing frame rate drops(Which isn't an issue when you emulate) and the lack of mid level saves. Both of which could be, in theory, resolved if it were ported to Eduke32. Anyone wanna call that Kaiser guy who did Doom 64/Turok EX and see if he wants the job? The "real" issue with Zero Hour is that they tried to make it like Tomb Raider instead of a fast paced shooter. The real issue with Zero Hour is that it's a console shooter in every aspect, designed to be played with a clumsy controller. There's also an issue with Eurocom's lacking imagination and creativity. Least it's better than Time To Kill and Land of the Babes. At least, I think it was. Oh definitely, it's far closer in style to Duke3D's action gameplay than TTK or LOTB. With those games you had to sorta wrestle the control to get a hang of it before it became second nature. Zero Hour benefits from the Turok style controls, and having the levels more or less built to work well with the controller setup. Oh, it's far better. I mean, I would actually call it a good game, though it has some definite flaws, consolization being one. Using the existing assets to remake it as a an Eduke32 mod would solve that problem and PC-ize it again. BTW, didn't someone post screenshots from a DNZH working in Eduke32 with the correct textures? I remember seeing screenshots of it, but the search function only provides the results as a thread list (not single posts) so it's pretty useless. It could, I believe, if you use Duke 3D as a base rather than trying to replicate everything from ZH, such as the low speed. That's exactly what I meant. Use the basic mechanics of Duke3D, and only add the functionality that DN:ZH has and Duke3D doesn't (e.g. additional weapons). That would also mean less work to do, and the end product being done sooner. I'm alright with just throwing it into EDuke32. Fox posted them working in Mapster32. As for the search feature, there is a toggle for "Display results" "As posts". This is fantastic! Duke Nukem: Zero Hour is a brilliant game, that seems to have received little attention from the press, and isn't even too well known amongst N64 fans, though the ones who have played it seem (from what I've read) to really like it. I always play it in first person mode (which you can do either with a saveable unlockable, or with a push button cheat) and it works just like a first person game except you don't see the gun in front of you. Anyway, amongst the few people who still play the game, there is one question that comes up from time to time; where is the missing enemy on the level 'Up Ship Creek'? For some reason, despite "Up Ship Creek"'s end level summation claiming that there are 64 enemies in the level, no one has ever verifiably gotten 64/64 kills. Every other level has it's own claimed number of enemies in place, but the best anyone can manage in "Up Ship Creek" is 63/64. Well, a couple of people claim to have gotten 64/64, which they might have, but they unfortunately don't know where the missing enemy was, nor can they get 64/64 now. So where is the 64th enemy? Is the level perhaps bugged, so the missing enemy is placed inside a wall, or 'outside' of the playing area, or is the enemy not a conventional enemy at all, and so we're walking straight passed it because we don't know it's an enemy (I really doubt that's the case, if only because surely an enemy would, by definition, be hostile to Duke, so we'd recognise it by it's attacking or hurting Duke). Or does the enemy only spawn after a given event, so that somehow we miss it, say by never going back again after passing by that point before it spawns? I doubt that too, as I've gone *all* over the level multiple times trying everything I could think of, with no success. So would it be possible, please, for someone technically minded, to look through DN:ZH's data, and find out if indeed all 64 enemies are visible and vulnerable in the level "Up Ship Creek"? It would be great to have this mystery solved once and for all. Don't forget that later in the game you "replay" the intro from the perspective of medieval Duke. Yes, you see the intro scene twice, first from the point of view of modern day Duke, then again later on in the past when Duke has travelled back in time and contacts his future self (well... his 'future' self as in his self in the future, but it's actually his past self, sort of, since he was the future Duke in the intro video before he became the past Duke in the same intro ). I'm not exactly sure of the solution but I've heard the only way to get a complete killcount is to run around the level randomly shooting rockets into all the walls. It's likely there's an enemy in a hidden room or something somewhere. Investigating the map would solve this mystery once and for all. Maybe I'll check it out later. having this would probably help. trying to look at the map in vanilla mapster is almost like trying to decipher hieroglyphics without the rosetta stone. That file has expired. Sendspace shouldn't be used for storing files that you want to be permanently available. Has anyone made any progress on this, please? Touchplates have their hitag / lotag values swapped. This happens with most effector sprites as well. 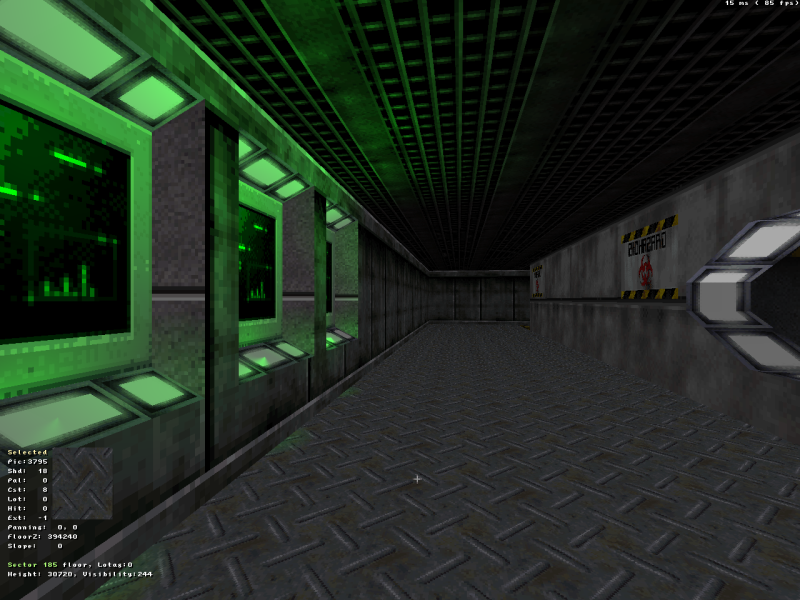 Aside from the regular Duke3D effects Sectoreffectors are used to designate doors as opposed to Duke3D's method of tagging the sector itself. SE 10 = Close Delay. The same as Duke3D but the hitag values are absurdly low and need to be multiplied to a higher value to be playable in Duke3D. SE 53 = Swing Door. The SE acts as the pivot. SE 54 = Slide Door. The sector clips through the wall which the SE's tail is pointing at. tile #28 = New Effector Sprite. This sprite is the key to most effects used through the maps. It behaves as a MUSICANDSFX, ACTIVATOR and/or MASTERSWITCH depending on the situation (It'll act as an ACTIVATOR if its tied to a switch but it'll act as a MASTERSWITCH if it's tied to a TOUCHPLATE) while also being used to connect buttons to another effectors. I ended up adding the placeholder "fix" for the doors in Fox's map preview script. Just save the following code as "mappreview.m32". I asked you this on discord but for insurance I wanted to ask again here. on the 18th of august, 2017, you posted: "Use this to view the levels (Duke nukem zero hour) in Mapster:" and then you posted a link to sendspace. That link is now dead. What did you use to view these levels in mapster32? By default the levels do not render correctly for me. I would forever o u 1 if you could help me with this. Thank you for any response. It's great to see some interest in the 'Up Ship Creek missing enemy' mystery - up until now it seems to have been only gamers who tried to find the missing enemy placement, and not mappers or programmers, so hopefully the solution might soon be found. It's fun to solve ancient mysteries. Makes you feel like Indiana Jones. Indy: "Do you know how long I've been looking for that?"